The Pend d’Oreille Winery has been integrated into the Sandpoint community since 1995, when first established by Steve and Julie Meyer. Pend d’Oreille Winery was recently purchased by Jim Bopp and Kylie Presta, who intend to carry on the legacy of award-winning wine production and continue to tell the story of Pend d’Oreille Winery. Our events throughout the year create great memories. Fire Dancing in February heats up Winter Carnival, the BYOB (blend your own bistro) party every April kicks off the spring in the best way, and perhaps the highlight is the Harvest Party in September. Jim Bopp, a Sandpoint native, has worked for Pend d’Oreille Winery since 1998. Jim is the head winemaker, intimately involved with each varietal through the entire winemaking process, vine to bottle. 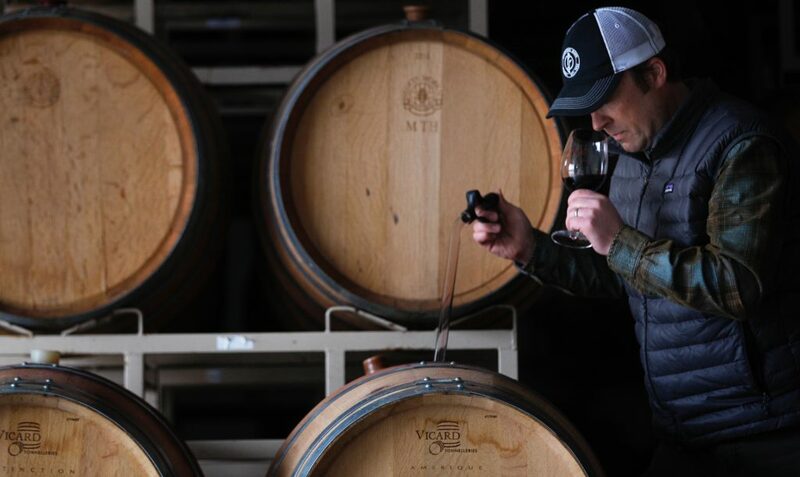 Jim’s expertise as a winemaker is paired with devotion to making balanced, outstanding wines, allowing no room for compromised quality or character. Pend d’Oreille Winery wines will not change under new ownership, but will continue to reflect Jim’s talents and experience as a winemaker. While the wines the people know and love will continue to be available, Jim and his team intend to offer new varietals as well. Jim also has his own label – Cottage Island Wines. His 2013 Deadhead Red made from 100% Petit Verdot took home a double gold at the 2015 Tri-Cities Wine Festival. Jim, his wife, Lori and their two children are centered in the Sandpoint community and are proud to represent Pend d’Oreille Winery as new owners. Kylie Presta, a Bonners Ferry native, has worked for Pend d’Oreille Winery for 5 years. After attending school, firefighting, and working as a carbohydrate chemist, Kylie and her family returned to North Idaho as home. Initially Kylie worked in the laboratory at the winery, analyzing grapes and wine through the fermentation and aging processes. Kylie then began assisting with harvest and bottling and soon realized the physical work and dedication required to produce the quality wines offered by Pend d’Oreille Winery. An appreciation for viticulture and winemaking has become a passion and she is excited to explore all aspects of the business as a new partner. Under new ownership, Pend d’Oreille Winery will continue to offer live music in the tasting room with your favorite wine selections. The Bistro Rouge refill program remains available, and the gift shop will continue to offer wine accessories and fun gifts. Local beer on tap and small plates are offered to enjoy any time of day. Relax in the comfort of the tasting room with a glass of wine, explore several wines through a wine tasting, attend Trivia Night or a Paint and Sip, and add to the story of Pend d’Oreille Winery. The Winery’s tasting room and lifestyle gift shop are not to be missed when visiting Sandpoint. They are open daily for tasting. The wine bar and tasting room features an elegant bar made of molded concrete and refurbished hardwood from the Belwood remodel, all created by local craftsmen. 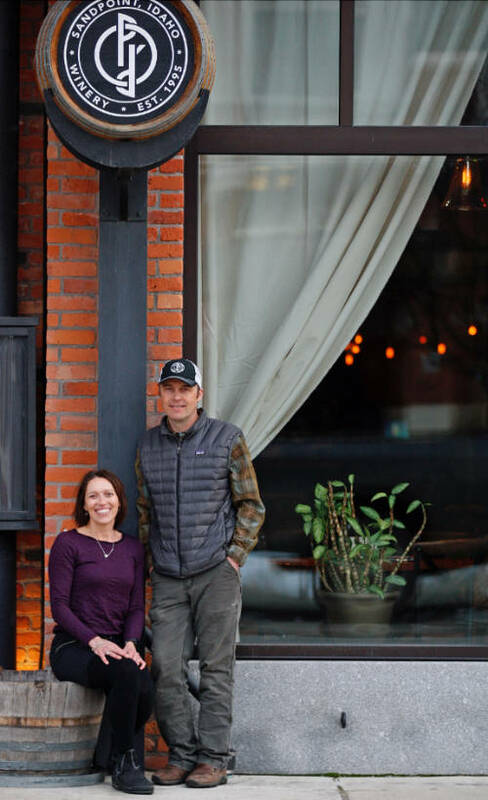 Jim and Kylie and their supportive families are thrilled for the opportunity to keep Pend d’Oreille Winery in operation, producing wine and bringing a new inspiration to a familiar space. The Pend d’Oreille Winery works as team- a strong team of employees and a supportive community. Using traditional French methods and grapes sourced from world-class vineyards around the Northwest, Pend d’Oreille Winery produces award winning wines including Chardonnay, Syrah, Merlot, Cabernet Sauvignon, Cabernet Franc, Pinot Gris, and Reserve Cabernet Sauvignon. New exciting varietals are on the horizon as well. These award-winning wines are getting recognition at some of the most prestigious festivals in the west. The 2007 Cabernet Sauvignon won a Double Gold medal at the San Francisco International Wine Competition while our 2009 Bistro Rouge won a Double Gold and our 2012 Syrah won a gold at the Tri-Cities Wine Festival. More recently the 2016 Chardonnay won Silver from Tastings Wine Competition in Chicago, the 2013 Reserve Cabernet Sauvignon has received Triple Gold medals as well. If you don’t have an opportunity to visit, be sure to look for the Pend d’Oreille wines in fine area restaurants and retailers as you dine in Sandpoint, Spokane and the surrounding area.